The 69 metre Feadship superyacht Samaya has been spotted on sea trials off the coast of the Netherlands as her delivery draws near. 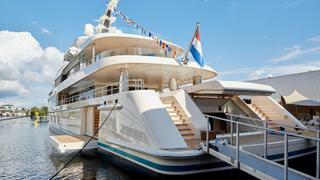 Christened last month, this displacement yacht features exterior styling and naval architecture by De Voogt. British design studio RWD developed the interior spaces, which are believed to total around 1,600 gross tonnes. 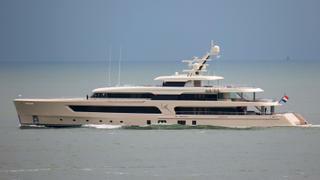 When delivered she will be counted among the top 200 largest yachts in the world. Accommodation is for up to 12 guests split across six staterooms, including an owner's suite, four guest staterooms and a VIP suite. 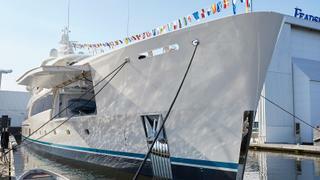 What's more, her crew quarters allow for a staff of up to 16 people. Key features include a fully-stocked foredeck garage, complete with two tenders (measuring 7.2 metres and 8.8 metres long respectively) and numerous superyacht water toys. 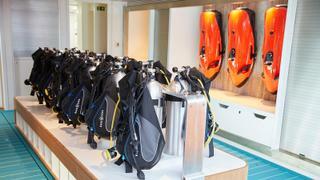 However, the star of the show is undoubtedly the dive centre, with its teal coloured floor, bespoke layout and nitrox-enriched air system. The European client's love of diving and desire to protect rare underwater species is further reflected in the manta ray symbol built into the superstructure of Samaya. To improve guests' post-dive experience, Samaya has been fitted with a recovery plunge pool, while her climate-controlled interior can be heated to 30 degrees centigrade to further aid recuperation. The yard adds that the hull has been finished in a shade called lunar white, which will reveal hints of a warm pink hue at sunset. Meanwhile, the teal waterline stripe is inspired by a rare tropical fish that the owner once encountered on a diving excursion. Samaya has spent almost three years in development, with Asian broker Lee Marine introducing the client to Feadship during the 2014 Monaco Yacht Show. Bas Nederpelt, director at Feadship, adds that the letter of intent was signed within three days of the introduction and the project later grew in length by around five metres. Power comes from a pair of CAT 3512C engines that allow for a top speed of 16.4 knots and a maximum range of 5,000 nautical miles drawing on a total fuel capacity of 160,000 litres. Other projects currently under development at the Dutch yard include the 110 metre flagship project Feadship 1007, which is due for completion next year.